- Ships from EZISTOCK office in Thailand. Sirada evokes exotic tropical colors with the design of this handcrafted necklace. 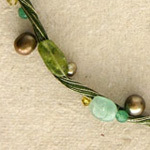 The talented artisan knots luminous pearls, peridot, quartzite and sparkling glass on soft rayon threads. The feminine necklace is adjustable in length and closes with a lobster claw clasp. This product may vary slightly in colors, weight and size. Natural stone - slight variations and small defects in the stones are to be expected. Color discrepancies may occur between this item and your computer screen. 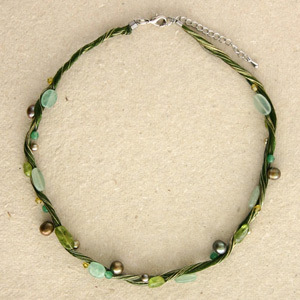 Materials: Pearls, dyed quartzite, peridot, glass, rayon and stainless steel. Clasp type: Lobster claw clasp. This product was designed and handcrafted by Sirada Chongsukwarakul. She was born and grew up in Chiang Mai. She is married and has a young daughter. 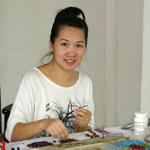 She has a passion for flower arrangements and jewelry making. She draws inspiration from nature, beautiful flowers and crafts her jewelry accordingly. She works from home in Chiang Mai. ... Read Sirada's full biography on Ezistock Blog.